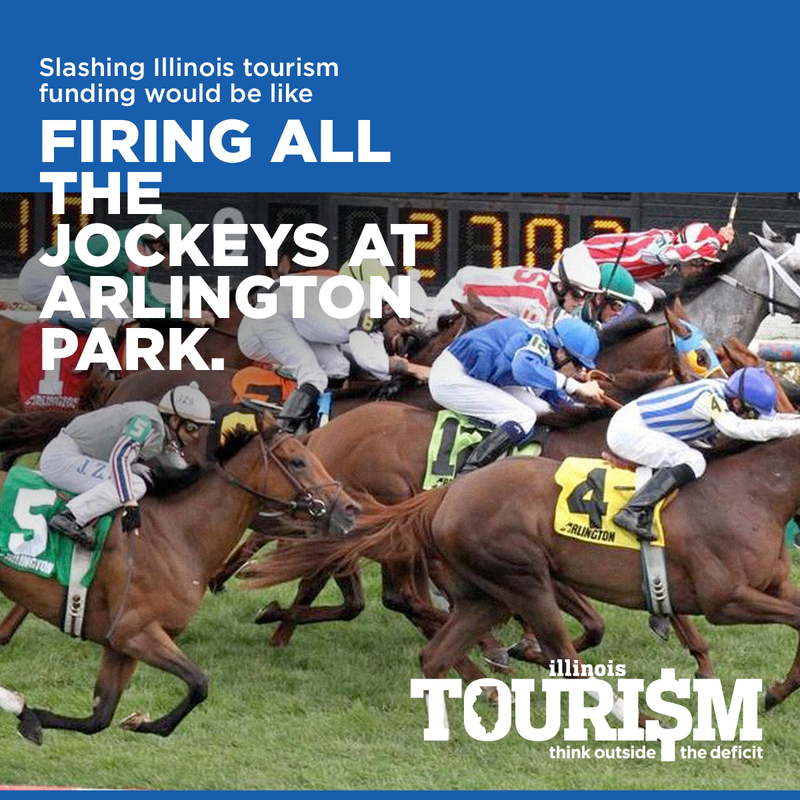 Due to the current budget impasse , Illinois tourism’s statutorily mandated funding from the state has been cut. Because of this impasse, we are taking this opportunity to continue to educate our constituencies and legislators on the value and economic importance that tourism plays. At the present time, we do not know the funding amounts available in state grants to operate our organization in FY 16. Based on this unknown, many Illinois CVBs are cancelling or shortening ad campaigns and visitors guides, eliminating staff and delaying the planning of fall and winter campaigns. On July 1, the Governor asked MPEA to suspend funding for Choose Chicago. Because Chicago is our regional tourism anchor and a worldwide destination, this impacts each and every one of us. This is a devastating blow to our efforts to bring visitors to our state. In 2013 alone, Illinois hosted over 105 million visitors and those visitors spent over $34.6 billion in our state. Those visitor expenditures generated over 300,000 jobs for Illinoisans, and the state and local taxes generated reached $2.6 billion. Tourism remains an economic driver for Illinois and can certainly help with the state’s turnaround more quickly than most industries. We are asking for YOUR help. As a partner and champion, you know what Tourism does for the entire state and the Chicago Northwest region. We have drafted an electronic letter to the Governor, your State Senator and Representatives below. If you support our efforts, please electronically sign this letter and send it on to the Governor as well as your State Senators and State Representative asking them to continue giving Tourism the statutorily mandated funding from the state. CLICK HERE, fill out the information and hit send. The form will automatically generate all of your information directly into the letter to Governor Rauner and your respective Senator and Representatives. When visitors come to Illinois they enjoy our cities, towns, and countryside. They fill our hotels, meeting centers, restaurants, shops, and attractions. And most importantly, they leave behind an economic impact that drives billions of dollars to the bottom line. But right now that engine is threatened, putting at risk more than $2.5 billion in annual tax revenue precisely at a time when Illinois can afford it least. Yet that is exactly what is on the horizon as the Illinois legislature and Governor Rauner consider proposals to slash funding to the tourism industry. Using only a small portion of hotel tax revenue — and not the tax revenue generated from Illinois residents — the state has reinvested the money spent by visitors. Since the 1980s, Illinois has been among the nation’s leaders in innovative sales and marketing efforts that have drawn more visitors to the state. Like a farmer who uses seed corn to deliver bumper crops, the results have been impressive. In 2014, a record 107 million visitors came to Illinois, the fourth consecutive year for a new mark. Those people didn’t show up by accident. They were drawn here in many ways — from incentives to conventions and trade shows, to advertising and marketing in the U.S. and across the world, to partnerships with local organizations. The seed money is now threatened in the proposed state budget. More than $30 million in hotel tax could be diverted away from drawing more visitors — and their spending and tax revenue — in a misguided effort to solve other problems. Illinois was ahead of its time 30 years ago when it recognized the need to reinvest a portion of visitor spending to continue feeding this economic engine. Today there are very tough choices facing Illinois regarding next year’s budget. But one easy choice that promises proven reward over risk is to continue the current funding for the visitor industry, and the billions that it will mean for the bottom line. Click on each image to download the full-size. Right click on the photo below and choose save as.